1. Heat a small nonstick skillet over medium-high heat. Coat pan with cooking spray. Add onion to pan; cover and cook 8 minutes or until golden brown, stirring frequently. Remove from heat; set aside. 3. Heat a large nonstick skillet over medium-high heat. Coat pan with cooking spray. Add beef to pan; cook 4 minutes or until browned, stirring to crumble. Add bell pepper to pan; sauté 2 minutes. Stir in chopped chipotle chile, adobo sauce, tomato paste, and next 3 ingredients (through tomato sauce); cook 3 minutes, stirring occasionally. Spoon 1/2 cup beef mixture over bottom half of each bun, and top evenly with onions and top half of bun. sounds like it will be yummy. I made this last night for dinner and I LOVED them!!!! 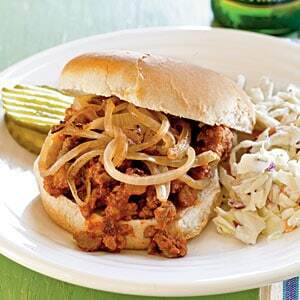 Great twist on Sloppy Joe’s…I’ll be making these often!